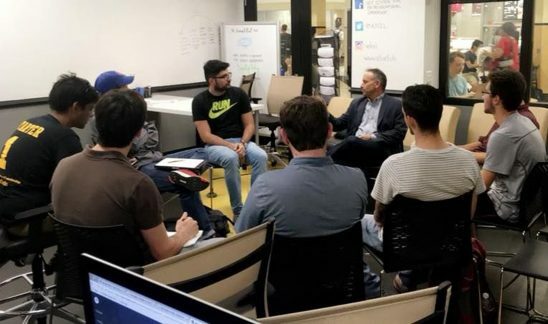 A new partnership between the Blackstone Charitable Foundation and Techstars, a global entrepreneurial network and start-up accelerator, will offer additional mentorship, start-up support and networking opportunities for students at the University of Central Florida. The two companies announced the affiliation with the College of Business on March 7 at SXSW EDU in Austin, Texas. Through this partnership, the UCF Blackstone LaunchPad will gain access to Techstars’ network of more than 10,000 mentors, worldwide entrepreneurial events, and content and startup services. UCF Blackstone LaunchPad director Cameron Ford called the partnership a game-changing opportunity for UCF. The UCF Blackstone LaunchPad welcomes hundreds of students from across campus each year, accepting more than 3,000 appointments and launching dozens of start-ups annually. UCF student and Capacitech Energy CEO Joe Sleppy advises other students at the Blackstone LaunchPad and used its resources to launch his business.